I've been looking into what APIs are required to get the latest IE cumulative updates for XP SP3 and 2003 SP2 to install, as well as IE7 and IE8. Other than those issues, IE 6 thru 8 SHOULD work without a hitch on 2000. The list of dependencies for both IE 7 and IE 8 have a lot of duplications, and 3 of the 4 requirements for IE 6 are propogated in both IE 7 and IE 8. I hate to double-post, but I feel that this is important enough to warrant posting. The updated advapi32.dll is breaking the device manager as it no longer includes WmiSetSingleInstanceW. Just looking through the file, you have a function called WmiSet8lngleInstanceAåYmiSetSingleISvtanceW located in it. If I had to hazard a guess, that's actually supposed to be two separate functions that wouldn't break the device manager, amongst other things. Would it be difficult to add "GetBestInterfaceEx" to iphlpapi.dll? It's required for BITS 2.5. What version did you use ? I perhaps fixed 3days ago. This is with the latest version installed. Also, tomaz, what sorts of issues crop up with those files? Cool! You were saying that shlwapi.dll doesn't work properly, but that's more of a shell component now anyway, I think. Is it 3/31 2:00(GMT) Version 5.0.2195.7047? Same version number. I was able to fix the issue by opening the file up in a hex editor and fixing 5 bytes to properly identify the functions. I can tell you what offsets need patching to save you some time, if you'd like. It doesn't show it, but that file is also build 7047. Is this perhaps an error with only the English version? The Time stamp is old. 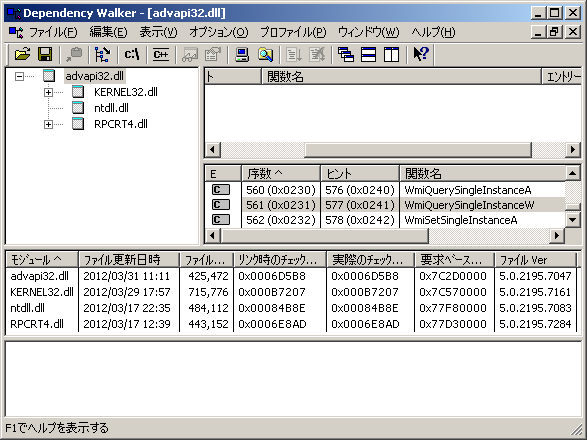 It seems to be v15p1 binary. Please download again v15p3 with clearance Browser cache. Thought I had the latest version installed already; that patch fixed the issue. Thanks!